The taxpayer must be employed or salaried. You have not received any HRA Exemption during the Financial Year, in that case you can claim deduction under section 80GG. You, your spouse, your minor child or a HUF of which you are a member does not own a residential property in the city you are currently residing, performing duties of office or employment or carry on business or profession. If you own any residential property at any place, for which your income from House Property is already getting calculated then in that case you will not be allowed any deduction under sections 80GG. If you want to claim deduction under section 80GG, you will have to fill Form 10BA, which will contain the details of your rent payment. How much deduction the taxpayer can claim under section 80GG? 25% of total Income (income to exclude long-term capital gain, short-term capital gain under section 111A and Income under section 115A or 115D and deductions 80C to 80U. Also, income is before making the deduction under section 80GG). Actual Rent less 10% of Income (income to exclude long-term capital gain, short-term capital gain under section 111A and Income under section 115A or 115D and deductions 80C to 80U. Also, income is before making the deduction under sections 80GG). 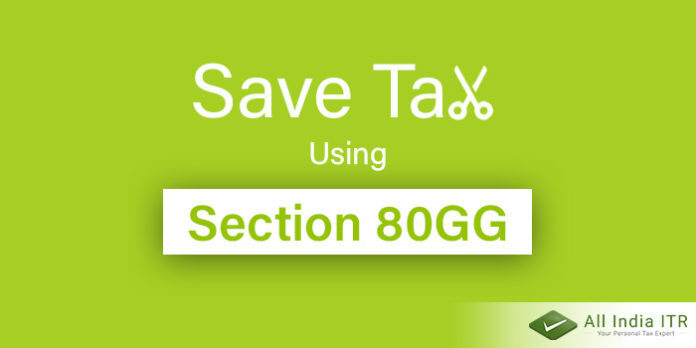 The lowest of the above-mentioned conditions will be considered as deduction under sections 80GG.